We are very happy to be working with Dr. Fatemi. It’s always a great compliment and pleasure to be working with a client that was referred to us. It’s a constant reminder always deliver real results to keep our current and new clients happy. Dr. Fatemi is a Gaithersburg dentist in Maryland specializing in cosmetic, family and sedation dentistry. Within just a couple months Dr. Fatemi has seen results and now we will begin marketing in Lexington Park, MD. “When business slowed, I would talk to my other colleagues about their business and they would tell me their business has picked up dramatically. When I ask them what they are doing they say Google Maps Marketing,” said Dr. Fatemi. When it comes to phone books and mailers like Val Pak, Dr. Fatemi was not seeing a big return on his investment. He knew he had to get his dental office on the internet and that’s when one of our other dentist referred us to him, the rest is history. If you are a dentist who would like to learn more about Google maps marketing or local seo please visit dentist seo marketing. The below image is a screen shot of one of our clients mobile Google Marketing campaigns. Using Google’s call ad extension we can dramatically improve the conversion rates and more importantly phone calls. When you enroll in our Google maps marketing program you will get higher positioning in both Google PPC ads and Google’s organic search results or local search results. This client Kincaide Construction, is a Detroit dumpster rental company that has two websites that are #1 position on Google Mobile and #1 organically which is kincaidedumpsterrental.com and dumpsterrentalsdetroit.com. 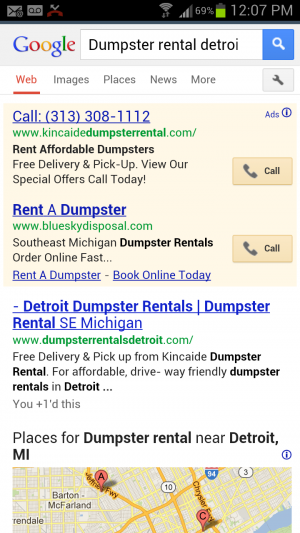 If you look closely you will notice the www.dumpsterrentalsdetroit.com is even above Google Places! The benefit to this whether the client is searching on their smart phone or on a desktop computer, Kincaide Construction can be found on all devices. If you would like to learn more about how we can get you more leads visit Google maps marketing. Will Google Mobile Marketing Work For My Business? Now more then ever the importance of Google Marketing is increasingly vital to your businesses success online. When I speak to clients I notice the words “pay per click” or “PPC” tend to leave a bad taste in their mouths. Maybe this is best suited for another post in itself, but the bottom line is small business owners have been taken advantage of. If you are one of the small business owners reading this you may have been told to give a big advertising budget without knowing what amount goes to Google and what amount goes to the online advertising company. Simply put you don’t know if the advertising company is taking 10% or 60%. The second issue is most people in the Google Marketing business know more about selling rather then creating an effective Google Mobile Marketing campaign. The fact of the matter is if done correctly Google mobile marketing and even Google Adwords can increase your sales drastically. Much if not all of our business comes from referrals if you feel you need more proof then see our Get Local Results page. *The client used as in this example is a current client with Get Local, if you are a local business in Michigan and would like to see more local business in your area getting higher rankings on Google then visit Michigan Internet Marketing to learn more. Recent studies have shown not just on Facebook are we seeing an increase in mobile users but on Google too. If you currently have a PPC marketing campaign you may have noticed the increase of mobile users within your Google Adwords as well. In 2013 many researches believe more people will be browsing search engines using the mobile phones then desktop or laptop computers. In most families there is a phone for every family member and even if there are computers in the household people now are more likely to browse for something on their tablet or mobile device because of convenience. I have a desktop and a laptop and when I’m on the couch and I need to browse online I just reach in my pocket and grab my phone. A little off topic but I remember a day when you had to go to a friends house or library to use a computer for a home work assignment and now we have mini computer that fit in our pockets, amazing. If your still thinking…So why do I need mobile marketing for my business then read on. With more and more people turning to mobile phones to browse for a local service in their city the importance of being found on Google Places is at an all time high. In order to get your business found on the first page of Google on mobile devices you need Google Maps Marketing.